Because I record all of my music on the Mac, I tend to focus most of my attention on software designed for that purpose. However, there are other important factors to consider from the outset-one of the most important is choosing the right guitar for the job. You can get away with a lot playing live, but when it comes to recording, you’re looking for a tone as close to perfect as you can get. Like most guitar players, I fiddle around with my tone endlessly, always trying to get that perfect sound.I do use some effects-not as a way to shape the sound that I want, but as a way to enhance the sound I already have. That’s where choosing the right guitar comes into play. Far too often, I see guitar players load effects onto their guitars in an attempt to boost the signal, but instead they end up muddying the tone. Again, in a live situation that may work, but it’s a disaster when trying to record. Approach your buying experience knowing what you want to do with your instrument. Do you want to record? Play live? Just have fun and play many different styles of music? Your decision will have an impact on what type of guitar you end up buying. For example, If you’re a blues player, picking a high-gain, active pickup, heavy-metal-focused guitar probably won’t be the best choice for your type of music. Likewise, you won’t want a passive pickup jazz guitar if you’re a heavy-metal player. If you get the right guitar for your type of music, you’ll rely less on experimenting with effects to get the killer tone you’re looking for. Currently I have 11 guitars that I use for playing and recording music. From a Taylor acoustic to a 23-year-old Fender Squire Strat, I can get the right tone for almost any genre I want to play. Of course, you’re not going to go out and buy that many guitars all at once-my collection has accumulated over 20 years. For example, when I started recording a new album this past year, I picked up three new guitars-each selected for the specific tone it brought to the songs. Here’s a look at what each offers the recordings. There are so many choices when looking for an acoustic guitar. 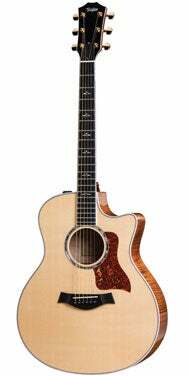 I chose Taylor’s $3,948 GS616ce acoustic/electric cutaway model. Made from big-leaf maple and sitka spruce, it’s an unbelievably great-sounding guitar that inspires you to write songs just by playing it. I like cutaway models for playing those lower frets during an acoustic solo. I also decided to go with the combined acoustic/electric because I would be playing live as well as recording with it. I’ve tried recording with the 616 plugged directly into my Mac audio interface and with a microphone-both produced great results. I’ve written two acoustic songs for the album so far, and I’m very pleased with the results. On the electric front, I picked up two guitars. One of them is Taylor’s $2,398 SolidBody Standard. I first saw the Taylor SolidBody at the NAMM tradeshow in January 2008 and was intrigued-Taylor is known as an acoustic guitar company. After playing one in a room off the show floor, I was very impressed with how it felt in my hands and the ease of the fretboard. It’s also impressive that Taylor designed its own pickups and bridge, as well as including technology developed from years of guitar making in the neck and body. The Taylor SolidBody is one of the most versatile guitars in my collection, producing a very warm blues tone through my Vox AC30 amp and a chunky tone for rock songs through my Randall amp. It’s a versatile guitar that gives you the best of both worlds for tone. Sometimes chunky just isn’t enough. I’m a huge fan of Ozzy Osbourne and Black Label Society, so I often find myself writing and playing songs that require a lot of gain. As I said earlier, I would rather achieve the tone I’m looking for by choosing the right guitar instead of adding overdrive or other effects. The $1,749 Washburn Signature WI66ANC Nick Catanese (named after Black Label Society’s rhythm guitarist) has a solid mahogany body and neck with an ebony fingerboard. It also comes with my favorite pickups, the EMG 81 (neck) and EMG 85 (bridge). The tone from this guitar is simply killer. I’ve found there’s no amount of effects that I can add to my other guitars to create the raw tone that I get from this one. As a matter of fact, I’m not using any external effects at all when I record with it. If you’re looking to get a high-gain sound for pinch harmonics or that classic heavy metal tone, you must check out this guitar-it’s now my go-to guitar for recording this type of music as well as playing it live.